Teaching Position: Post-Doctoral Fellow, Princeton University, Near Eastern Studies Department (2007-2008); Assistant Professor of History, University of North Carolina-Charlotte (August 2004-Present). Education: Ph.D. in History and Middle Eastern Studies, Harvard University, November 2002. Major Publications: Aydin is the author of Politics of Anti-Westernism in Asia: Visions of World Order in Pan-Islamic and Pan-Asian Thought (New York: Columbia University Press, Global and International History Series; 2007). Aydin is also the author of numerous scholarly journal articles, book chapters and reviews including: “A Global anti-Western Moment? The Russo-Japanese War, Decolonization and Asian Modernity” in Sebastian Conrad/ Dominic Sachsenmaier, eds., Conceptions of World Order, ca. 1880-1935. Global Moments and Movements (New York City: Palgrave Transnational History Series, 2007): 213-236; “The ‘Question of the West’ and Alternative Visions of World Order in Interwar Era Japan and Turkey: What Does a Comparison Teach Us?” in Toshihiro Minohara and Kimura Masato, eds, Turbulent Decade: Japan’s Challenge to the International System of the 1930s (University of Toronto Press, Forthcoming in 2007); (co-authored with Juliane Hammer) “Introduction to the Special Issue on the Critiques of the ‘West’ in Iran, Turkey and Japan”, Comparative Studies of South Asia, Africa and the Middle East, Vol. 26:3 (Fall 2006): 347-352; “Between Reverse Orientalism and the Global Left: Islamic Critiques of the West in Modern Turkey,” Comparative Studies of South Asia, Africa and the Middle East, Vol. 26: 3 (Fall 2006): 446-461; “Beyond Civilization: Pan-Islamism, Pan-Asianism and the Revolt against the West,” Journal of Modern European History, Vol. 4:2 (Fall, 2006): 204-223; “Overcoming Eurocentrism? Japanese Orientalism on the Muslim World (1913-1945),” Princeton Papers: Interdisciplinary Journal of Middle Eastern Studies, (Fall, 2006): 139-164; “The Politics of Conceptualizing Islam and the West,” Ethics and International Affairs, Vol. 19:1 (Winter 2005): 93-100. 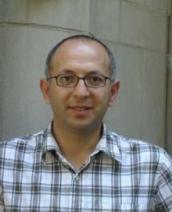 Aydin’s works in progress include a book project on “From Arnold Toynbee to Ali Shariati: Islam and the West under the Shadow of the Cold War,” -Sponsored by a Fellowship from Princeton University Near Eastern Studies Department, and the “Selected Works of Ismail Kara” (Translation of eight selected articles by a leading historian of late Ottoman-Turkish intellectual history). NATO Student Workshop Fellow, Brussels, June 1991. Formerly Academy Scholar, Harvard Academy for International and Area Studies (Oct.-2002-Dec-2004), and Assistant Professor of History, Department of History, Ohio State University (January 2004-July 2004). Collaborative Research Projects include German Research Foundation (DFG), “Conceptions of World Orders in Global History,” June 2004-June 2007, and Shibusawa Foundation, “Turbulent Decade: Japan’s Challenge to the International System of the 1930s,” September 2003-June 2006. Growing up in Istanbul, I always found it awkward to read the “Welcome to Asia” and “Welcome to Europe” signs at the two ends of the less-than-a mile long suspension bridge over the Bosporus waters. These innocent looking continental demarcation signs meant very little to the millions of commuters, supposedly moving between continents every day. In high school, we were taught that Turkey is an important bridge between East and West, as well as Asia and Europe. I remember one time joking with friends that we needed to tidy up our ties and jackets while crossing the bridge from the Asian to the European side of the city, sarcastically reflecting predominant judgments associated with the two continents. I would have never predicted that I would later spend years during my graduate study examining the history and politics of the historical construct of Asia and Europe (or East and West) and its impact. And ironically, but not unsurprisingly, while I was trying to historicize these civilizational and continental categories, stereotyped civilizational identities (think clash of civilization thesis…) embellished with new political and cultural inflections gained popularity in public discourse. My undergraduate years coincided with exciting debates on Eurocentrism and post-modernism in Istanbul college classrooms and coffeehouses. It was in a senior seminar paper on Jürgen Habermas’ critique of anti-modern thinking that I first remember arguing for a more global history of modernity and world order. My plan was to go either to China or Japan to have a non-Eurocentric comparative look at the question of the West and how Asian intellectuals have debated the universality of modernity in the last two centuries. But, to my frustration, the visiting Japanese professor whose guide to Istanbul I had become and who I hoped to study with in Japan told me not to come to the Far East, Tokyo, but to go to the Far West, to a university in America, if I was that interested in non-Eurocentric perspectives on global history. Only after my first semester at Harvard did I realize the wisdom of his advice. History departments at many American research universities have experts covering all the regions of the world, with ideally half of the faculty teaching non-Western fields. This intellectual presence not only provides perspectives into the different regional histories, it also allows for important insights into world and global history. Of course, I also made it to Japan where I spent two years learning Japanese and searching archives and bookstores. Looking back, I had a wonderful time during the eight years of my graduate school education, having a chance not only to immerse myself in East Asian and Middle Eastern histories, but to learn a lot about the modern histories of Africa, the Americas and Europe. I became addicted to the 4 pm seminars, accompanied by coffee or tea and cookies, though I had to limit my attendance to 2 seminars a week to be able to finish my dissertation and keep my weight. By the end of my graduate school years, I had become optimistic about the scholarly integrity and public mission of the historical profession. The events of and developments after September 11, 2001 did not change my confidence in my discipline. Yet, many of the achievements of my colleagues in dispelling historically rooted prejudices and misunderstandings among different societies were swept away by a flood of reasserted popular stereotypes about anti-Western Muslims and imperialist crusading Westerners. The ‘us vs. them’ dichotomy as well as the ‘what went wrong?’ and ‘why do they hate us?’ questions forced many in the academic community to take a stand. The increased public interest in answers, explanations and lessons from the past in order to understand the current situation better has affected my research as well as my teaching. Last summer, a leading European politician sympathetic to Turkey’s potential membership in the European Union suggested that the Istanbul Municipality remove the “Welcome to Asia” sign on the bridge over the Bosporus, arguing that the sign and its implication of the “Asian” side of Turkey would weaken Turkey’s case in the European Union. Despite my awareness of the Eurocentric constructedness of these continental borders, I realized that I would not be happy to see the “Welcome to Asia” sign go away, at least not in this way. My admittedly idealist internationalism makes me want to hold on to this feeble continental tie between Istanbul, Calcutta and Tokyo. After all, our problem is not in the borders, or continental imaginations themselves, but in the value judgments and political projects vested in them. I could not help but smile when I saw the welcome signs on both sides of the Bosporus bridge during my last visit to Istanbul.